Enjoy some beautiful images in a simple theme. 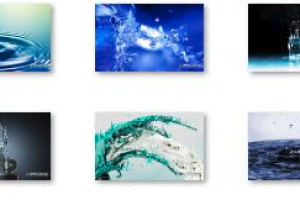 This package includes 10 images featuring 3D motion with water and waves. The wallpapers are mostly water and other liquid in motion with color schemes of grey and blue. This application contains a visually appealing set of images that can be a delightful change for your desktop. After installing this app, all the other settings to be adjusted can be located in the Windows desktop background settings. Wallpapers are another intriguing feature. Hence, beautiful wallpapers may also arrive in many diverse flavors and colours. There are a few gorgeous wallpapers out there. The pictures are high-quality photos at 1920 x 1200 pixels. 3D Motion Windows 7 Theme is licensed as freeware for PC or laptop with Windows 32 bit and 64 bit operating system. It is in themes category and is available to all software users as a free download.